October was a rocky month for stocks and banking shares were no exception, with analysts pointing out that shares crashed hard, mimicking a pattern that surfaced in the immediate run-up to the financial collapse ten years ago. 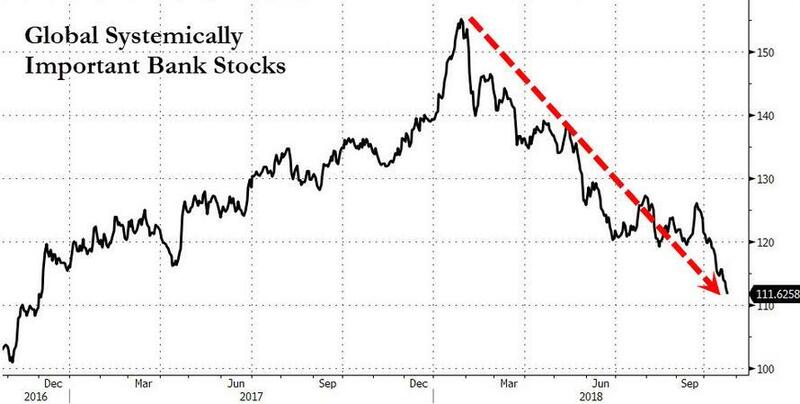 And as the banking sector emerged as one of the worst performers during a brutal month, as they often do, Deutsche Bank shares stood out as one of the worst performers as shares tumbled to all-time lows for the first time in roughly two years following a disappointing earnings report, reigniting perennial fears that the bank would need to be broken up or bailed out, even as rumors about a possible merger with Commerzbank continued to circulate. Making a bad situation that much worse, what was formerly one of the bank's largest shareholder, Chinese conglomerate HNA, has been dumping its shares amid a spate of government-ordered deleveraging. But as HNA dumped, it appears another institutional investor has stepped up to take the other side of the trade, sensing that, under a layer of dysfunctional management, there is hidden value there, particularly in DB's retail and trade-finance operations. As the Wall Street Journal reported, Hudson Executive Capital LP, led by former JP Morgan Chase & Co. finance chief Douglas Braunstein, has taken a 3% stake in the German lender - effectively taking the other side of the trade from HNA - cementing the activist fund's status as a top-five shareholder. Braunstein told WSJ that his trust in DB's turnaround plan stems from his confidence in the bank's new chief executive, Christian Sewing, a longtime employee who was brought in to replace John Cryan earlier this year. Since Sewing has taken over, the bank has failed a Federal Reserve stress test and paid a more than $500 million fine over its involvement in a $10 billion Russian money laundering scandal. But that hasn't dampened investors' hopes that the bank's turnaround man du jour might finally be able to produce some tangible results. As he told WSJ, the activist investor believes DB is taking "the right steps" to facilitate the badly needed turnaround. In Braunstein's estimation, Sewing, who is refocusing the bank on its European roots, is "the man for the job." He called transaction banking a “crown-jewel asset” that helps provide affordable funding, easing one of the lender’s big problems - its higher-than-average funding costs. Mr. Sewing, a career Deutsche Bank employee who became CEO when the supervisory board fired his predecessor, has said he is refocusing on the lender’s roots serving European companies and making its German retail banking more efficient. He wants it to be less dependent on trading businesses that historically have driven profits but have become more volatile. Mr. Braunstein praised Mr. Sewing. “We would not have made the investment but for the fact that we think he’s the right guy for the job,” Mr. Braunstein said. The fact that DB has hired Cerberus Capital to help guide the turnaround helped cement Braunstein's confidence. He added that a move by private-equity firm Cerberus Capital Management LP and its president, Matt Zames, to formally advise Deutsche Bank on cost-cutting and operational challenges was “a very significant positive.” Cerberus in November 2017 disclosed a roughly 3% position in the bank. Earlier this year, in an unorthodox move, Cerberus also became a paid adviser to Deutsche Bank. Messrs. Braunstein and Zames had worked together closely in senior JPMorgan roles. Mr. Zames was JPMorgan’s chief operating officer before leaving the bank last year. The activist taking a share in a major investment bank isn't without precedent. Some might remember that analysts, including CLSA's Mike Mayo, praised ValueAct for its decision to take a 2% "activist" stake in Morgan Stanley two years ago, with Mayo proclaiming that this level of accountability was "what the banking sector needs." He went on to explain that while Morgan Stanley has "an excellent franchise," its "execution has fallen short." For his part, Sewing praised Braunstein and and thanked him for the vote of confidence. "We appreciate Hudson Executive’s confidence in our ability to execute on our strategic objectives," Deutsche Bank CEO Christian Sewing says in e-mailed statement. For Deutsche Bank, the first statement doesn't really apply - the German lending giant is still struggling to shake off the trappings of the financial crisis - while the second is an exercise in understatement. Amid legal settlements related to DBs reckless sales of toxic mortgage-backed securities, massive unchecked derivatives exposure and floundering trading and investment banking businesses, Deutsche is a shambles. And while Braunstein's confidence in Sewing might be a comfort to board members by affirming that, for now at least, it appears they have bet on a horse with real potential, Sewing wouldn't be the first DB CEO in recent years who was heralded as a savior, only to leave the job exhausted and defeated. But, then again, if he could demonstrate even a minor improvement in earnings and fiscal accountability, there's definitely a lot of upside baked into DB's shares.